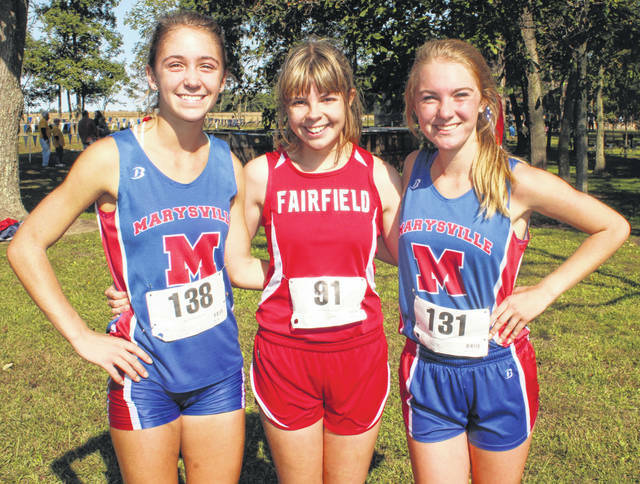 Fairfield’s Ciara Colwell (center) is pictured with Jacquelyn Witt (left) and Katherine Krueger (right) of Marysville on Saturday at the Washington Cross the Creek Invitational. Cross Country teams from Fairfield, Lynchburg-Clay and McClain traveled to the Walters Family Farm in Fayette County on Saturday,September 29, to take part in Washington Cross the Creek Invitational. In the boys race the Lions took first place in the team standing with a score total of 37 as all five of their top runners finished in the top 11 overall. Brandtson Duffie and Austin Setty were the top performers for the Lions and they finished fourth and fifth respectively in the event. Reece Schluep was the top finisher for the Tigers with a time of 18:52 as he finished 32nd. Austin Barnhill was the top runner for the Mustangs of Lynchburg-Clay and he finished in 47th with a time of 19:48. In the girls race the Lady Lions took second place with a total of 61 points. Ciara Colwell was the top performer for the Lady Lions with a time of 20:17 which was good enough for second place. Raelynn Ruble led the way for the Lady Mustangs with an 11th place finish and a time of 22:34. Listed below are the full team results for the boys and girls races. https://www.timesgazette.com/wp-content/uploads/sites/33/2018/10/web1_HS-girls-top-3-1.jpgFairfield’s Ciara Colwell (center) is pictured with Jacquelyn Witt (left) and Katherine Krueger (right) of Marysville on Saturday at the Washington Cross the Creek Invitational.